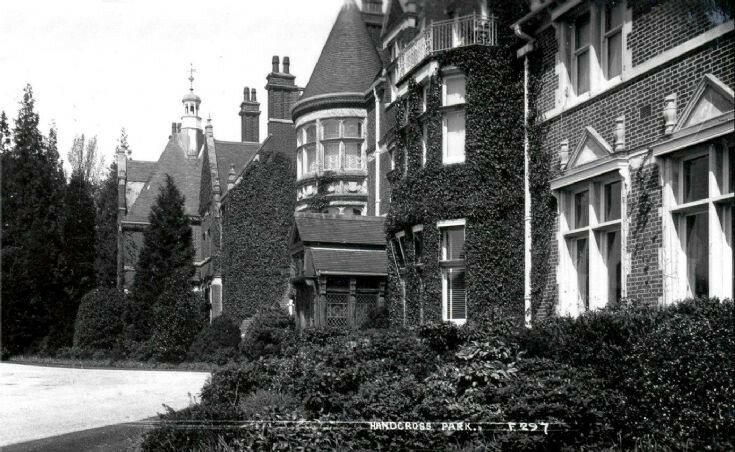 This postcard shows a view of Handcross Park when it was a private house before a fire destroyed it in 1935. The architecture shows fragments of a neo-classical design, particularly over the windows, but that is as far as my knowledge extends in that field! It seems to have been a common feature of houses, both large and small, in the early part of the last century to allow ivy and other climbing plants to cover the exterior of the house. Whether it was thought to be decorative or it added to insulation against cold weather, I am not sure. There are several pictures of Handcross Park on the website and these can be found by selecting the name of the house from the drop down menu under “Groups”. The Large Version shows a close up of the house.